After nearly eight months of attempting to gain access, Michael was permitted to photograph and interview inmates working with the Canine Partners for Life program. The photo essay examines the inner workings of a program called Canine Partners for Life. This non-profit enables maximum security prisoners to train prospective service dogs inside the prison for 12-18 months. Over the course of the program's 26-year existence it has placed over 650 service dogs in 45 states. During the time Michael spent shadowing the inmates he was permitted to photograph the dogs, inside their cells, throughout training sessions, and generally anywhere in the facility at SCI Greene Maximum Security Prison. The resulting article was published in five publications internationally. A handler practices commands with his dog Bingo, as others observe. 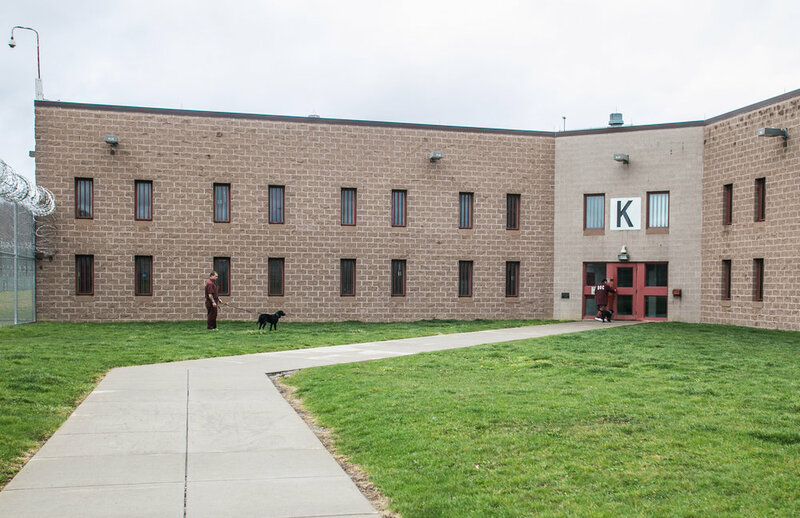 Nike, a trainee of the Canine Partner’s for Life program at SCI Greene Maximum Security Prison, practices tasks with her handler during a rigorous training session. Cassidy, a trainee of the Canine Partner’s for Life program at SCI Greene Maximum Security Prison, practices tasks with her handler during a rigorous training session. Handlers of the Canine Partners for Life program at SCI Maximum Security Prison review the day’s training session. Each inmate is given a personalized handbook to manage and record his canine’s progress. Nike, a trainee of the Canine Partner’s for Life program at SCI Greene Maximum Security Prison, rests before a rigorous training session. A handler watches on as the trainees are allowed much-deserved playtime. Handlers meet to discuss training techniques as they wait for the session to begin. Ralph, a handler in the Canine Partners for Life Program at the SCI Greene Maximum Security Prison, pats Nike on the head after a successful evaluation. Nike's photo taped to Ralph’s door below a green K-9 designation sign. Nike and Ralph rest momentarily during an evaluation. Nike, a trainee in the Canine Partners for Life program at SCI Green Maximum Security Prison, relaxes inside her handler’s cell after a successful evaluation. The training facility at the Canine Partners for Life Headquarters in Cochranville, PA. The campus of the Canine Partners for Life Headquarters in Cochranville, PA. The Canine Partners for Life cat, Lana, sits on the table in one of the storage rooms. "She runs things around here," Tonya, the CPL Director of Marketing, commented. Canine housing quarters at the Canine Partners for Life Headquarters in Cochranville, PA.
A volunteer walks one of the trainees on the campus of the Canine Partners for Life Headquarters in Cochranville, PA.
6-week old puppies being cared for at the Canine Partners for Life Headquarters in Cochranville, PA. The dogs will stay here for another 2-3 weeks before being transferred to a prison in Pennsylvania or Maryland. The introduction board walking into the main building of the Canine Partners for Life Headquarters in Cochranville, PA.